So first let me apologize for my extended absence. Over the Christmas holidays there were two trips to the emergency room, and one phone call for an ambulance. Not to be alarmist or dramatic, but my health has taken a turn and my energy levels are most definitely not what they once were. 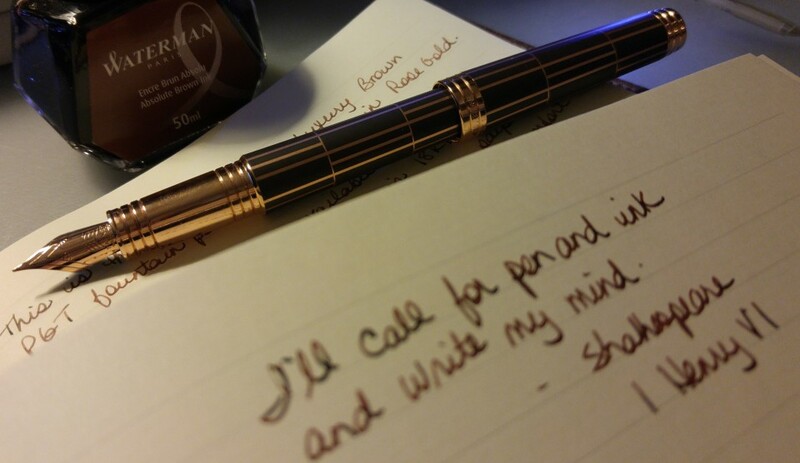 I received a beautiful fountain pen from my sister for Christmas and I have not even inked it up yet. I also received some beautiful journals from family and friends and they have not been opened. I have not been able to write in my journal for more than 10 minutes at a time. My life right now is about pain management stemming from my scoliosis. I have not been sleeping very well and I find it difficult to concentrate. I took three weeks off work and probably went back too soon. Even writing this has taken far longer than I anticipated. But…I will get better. I have a medical program I am following and every day I see improvement. I have incredible people in my life who help me and foster positive energy. I am slowly getting my life back to normal but I can’t give this blog the attention it deserves. I’ve been feeling terrible about the radio silence but at least now you know. Thank you so much for supporting this blog and for all of your kind words. This is not the end but a hiatus to allow me to get back to fighting form. I don’t want to over-promise and under-deliver so I will not put a time frame on how long I will be away. 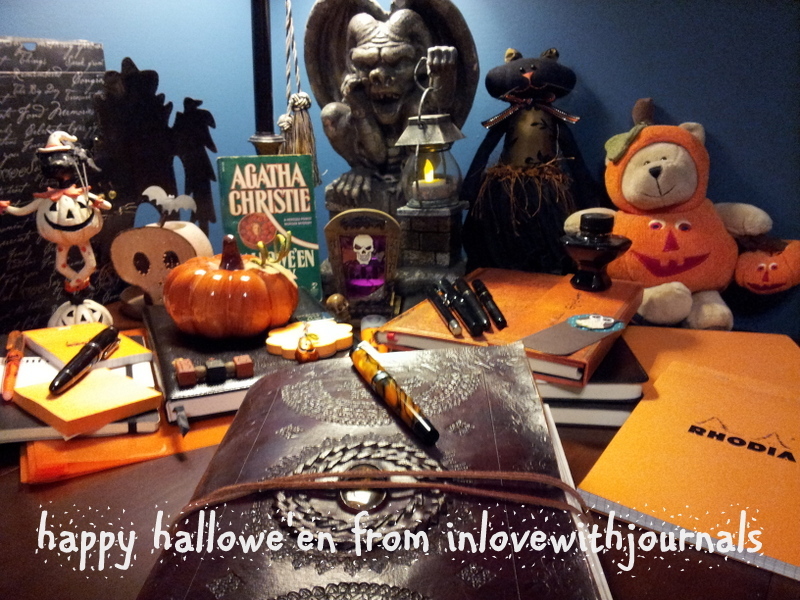 Know that I truly miss this blog and writing in my journal with my beautiful pens. I can’t imagine I will be able to stay away forever. Thanks for listening and happy journalling. This weekend we moved into our new, permanent home. And our things have been delivered from their storage. So many boxes! I have a small mountain of them in my new office. 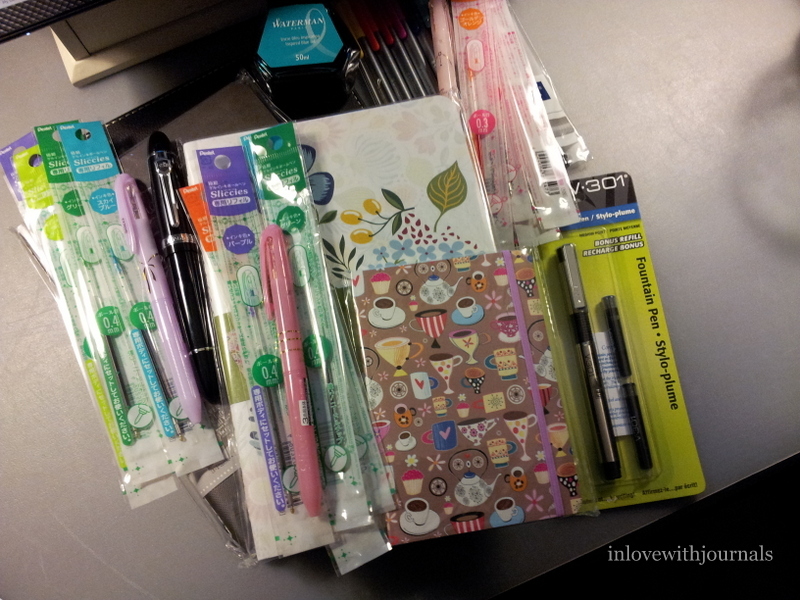 I am beyond excited to unpack and say hello to notebooks, inks, books and desk friends that I haven’t seen since April. It seems like a lifetime ago that I packed up my office in Calgary. And in some ways it is. Moving to Halifax has been amazing and terrible at the same time. Any of you who have made a great move, or indeed pulled off any great change, will know what I mean. We are so happy here and know deep within that this is where we need to be, spiritually, physically and mentally. But the process of “getting back to normal” has been a minefield of emotion. My job has been wonderful but frustrating in that it demands so much of my time; there is so much that needs to be done the only solution I can find is to work lots of evenings and weekends. The process of buying and furnishing a home has been daunting and time consuming. All of that takes away from “me” time, where I find myself unable to keep up with my previous schedule on this blog. I lose time for journaling and reading too, which makes me sad and fractious. To add to this my back conditions (scoliosis and sciatica) have been acting up ALOT of late. I am without my usual network of chiropractors and massage therapists but I’m slowly building a new team. I am blessed with a wonderful husband, family and friends who have helped enormously on this journey. You know who you are and I sincerely thank you. The great lesson of this move and my life for the last few months has been to be grateful for the wonder. I am aware of the magical more than ever before. Positive forces are at work in my life that I acknowledge and honour. This next chapter will be the best yet. And I intend to share as much as possible here, with you. So end my musings for another Sunday. I am sorry for my absence and I am working on that. I hope to resume normal operations on this blog before the end of this month. I’ve said that before but I feel better able to accomplish it now, with my old familiars jumping out of every box I open. I have the results of the Thank you for 500 Subscribers Giveaway! First let me say a huge thank you to all of you who entered; when I was going through the comments this morning I didn’t see a reply from me to all of them and I meant to do that! So thank you, thank you, thank you. And to those of you who follow this blog, a huge thank you as well. I started this blog as a creative outlet for myself, never thinking I would connect with so many of you as I have done. This blog is a source of joy for me and I am so happy that it’s still going strong and all of you are still here. It means a lot to me. Thank you, thank you, thank you. Now on to the good stuff! 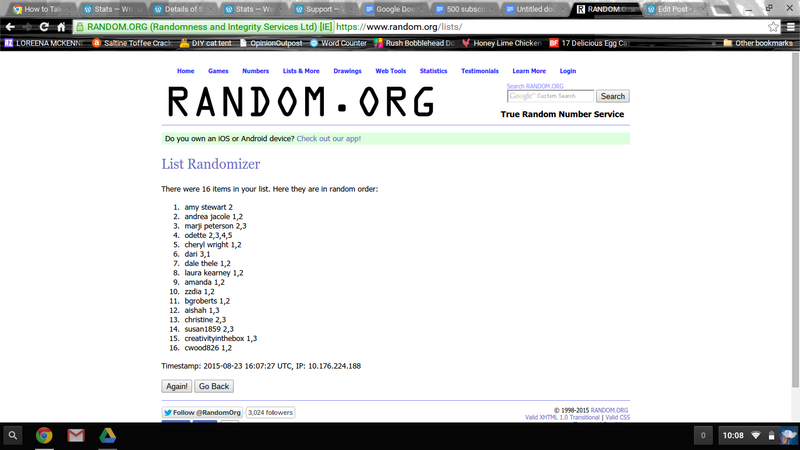 Below is a screenshot of all the names (16) that commented on the post, within the time frame set by the rules of the giveaway. I made one entry per commenter. And here is the screenshot immediately after I hit the Go! button for random.org to randomize the list of names. You can see the date and time stamp. So the above 5 people have until midnight on Sunday, August 30 to send me their mailing details via the Contact Me button above. 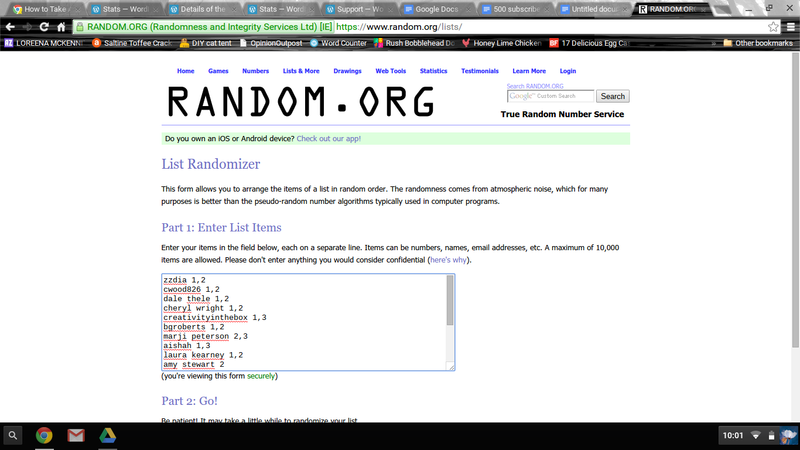 If I do not hear from one of the winners by the deadline I will choose the next person on the list to win that prize. And to those of you who did not win I will be having more giveaways. Congratulations to the winners and thank you again for all your support! If you haven’t already, enter my Thank You for 500 Subscribers giveaway. It is open until midnight tonight and I am giving away 5 prize packages. I Want To Say Thank You…With A Giveaway! In May of 2012 I wrote my very first blog post. I was hoping to write once per week and now I’m into a rhythm of at least 5 per week. It is my joy. And it wouldn’t be as joyful without you, my subscribers. Recently I hit a personal milestone of 500 subscribers. To say Thank You I am giving away everything you see in the picture above (excluding the computer, the white stand and the desk!) There will be 5 winners (5 for 500!) and the giveaway will be open internationally. Check back this Saturday for all the instructions on how to enter and the details of each prize.